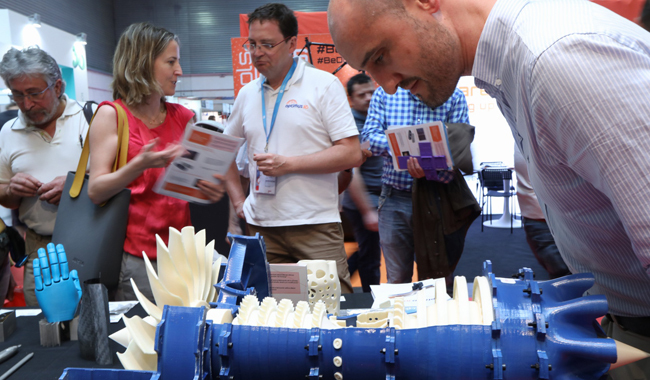 The 87 exhibitors participating at ADDIT3D, the additive manufacturing and 3D printing international fair, is exceeding all expectations in terms of visitors and the interest shown by thousands of professionals who have visited the Bilbao Exhibition Centre to learn about specific applications in the field of the Industry 4.0, which is spearheading the transformation of production processes. The advances in additive and 3D manufacturing range from printers with two heads that can print in two different colours or materials, printers that create precision and reliable prototypes for concept verification, design validation and verification of functional performance, and printers that render very high quality physical pieces, up to ten times faster than traditional 3D printing methods and at half the price, among other solutions. ADDIT3D has also hosted technical sessions in which it has addressed the great challenges and trends of the sector, analysing specific applications in very diverse areas. Around 30 speakers from innovative companies have presented the latest on new strategies in the design and manufacture of complex parts, new applications in 3D printing and advances towards digitalisation.